Two recent studies highlight the risks with gastrostomy tube (G-tube) placement. McSweeney ME, et al. J Pediatr 2015; 166: 1514-9. Jacob A, et al. J Pediatr 2015; 166: 1526-8. The first study, a chart review of 591 patients, identified a 10.5% major complication rate and ~25% complication rate overall. By far the most common complication for both major and minor complications was stoma infections. In this study, the g-tube used was the Corflo PEG tubes using a pull-procedure. Perioperative antibiotics (i.e. cefazolin for 24 hrs) were administered. Exchange of g-tubes (to a skin-level device) took place at 6 months in most patients. Major complications were defined as an unplanned adverse event necessitating additional hospitalization, surgery or interventional procedure. Among the 62 patients experiencing major complications, 55 of the 72 were due to infections, 6 were dehiscence of PEG at exchange, 2 were due to granulation needing surgery, 2 were due to colon perforation, and 1 due to pneumoperitoneum. Other major complications included: 1 aborted PEG procedure, 1 post-PEG cardiopulmonary arrest, 3 malfunctioning PEG tubes, and 1 failure to exchange PEG tube for a skin-level device. Overall, this study shows a fairly high rate of significant complications and that their occurrence was usually not in the immediate post-operative period. The second study was a prospective study of 183 children undergoing a one-step percutaneous G-tube using the MIC-KEY introducer kit. This one-step button requires insertion of three gastropexy anchors, dilatation of gastrostomy tract, and button measurement. The authors evaluated the safety technique and the learning curve. In the first 6-month period, the authors noted a 17% failure rate; this declined to 0-7% in the following 6-month study periods. The authors highlighted several advantages: 1. lower peristomal infection rate (10.6% compared to their historical control of 29% with pull-PEG); the PEG avoids need to bypass the oropharynx. 2. One procedure/anesthetic for a skin-level device. In the article, the results indicate that there are clearly tradeoffs for these advantages: after the initial learning curve, their remained complications in the majority (65%), mostly mild complications which included accidental button removal (35%), gastric heterotopy (24%), and peristomal leakage (15%). Also, 35% of patients returned for a replacement tube before the planned date because of intragastric balloon deflation. The cost savings with this one-step button were estimated to be 11% lower. 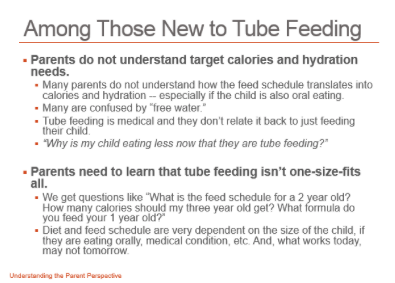 Bottomline: While g-tubes remain important in caring for children with feeding problems, there is not a magic bullet to eliminate complications. 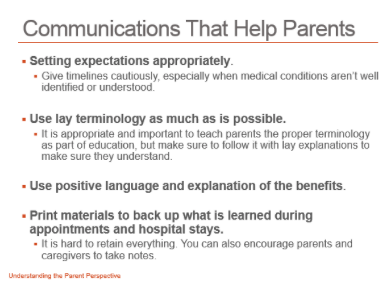 Understanding the frequency of these problems and discussing them with families will help them be addressed promptly. Thanks to those who attended yesterday’s talk (10/24/14) at the clinical practice session and to those who provided helpful feedback. 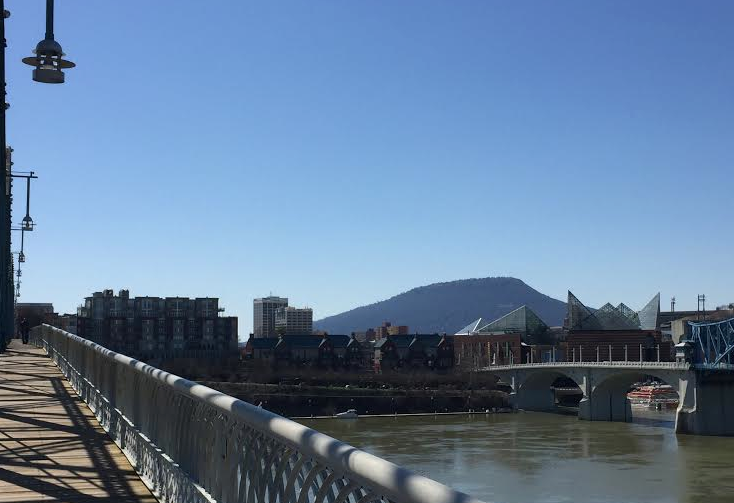 This blog entry has abbreviated/summarized the presentations. Though not intentional, some important material is likely to have been omitted; in addition, transcription errors are possible as well. If you make it to the bottom of this post, you will find some useful patient resources along with previous related blog entries. This was a very effective lecture; it brought together a lot of useful information. Wu G, et al. Science. 2011 Oct 7;334(6052):105-8 The Bacteroides enterotype was highly associated with animal protein and saturated fats, which equates to frequent meat consumption as in a Western diet. The Prevotella enterotype high values for carbohydrates and simple sugars, indicating association with a carbohydrate-based diet more typical of agrarian societies. Holmes et al. Cell Met 2012; 16: 559. Diet serves as a substrate for the microbiota to produce certain metabolites. High vegetable intake was associated with decreased UC risk. Enteral diet for IBD can improve stool calprotectin within 1-2 weeks. Take-home messages: Don’t tell your patients with non-stricturing IBD to eat a low fiber diet. Reduced red meat and reduced oral iron may be helpful. Vegetarian diet and Mediterranean diets may be helpful. Top Lecture: Enteral Nutrition for Crohn’s Disease . Evidence for use of low FODMAPs diet is best in adult irritable bowel syndrome. Chumpitazi BP et al. NASPGHAN 2014 abstract n=33 pediatric IBS. Favorable response noted to low FODMAP diet. Dietary recommendations were reviewed along with the caveat that obtaining the assistance of a dietician/nutritionist is recommended. Nutritional disorders are highly prevalent in children with neurological disabilities: 29-46% are underweight; 8-14% are overweight. Improved nutrition improves behavior, activity level, improves growth, and reduces infections. 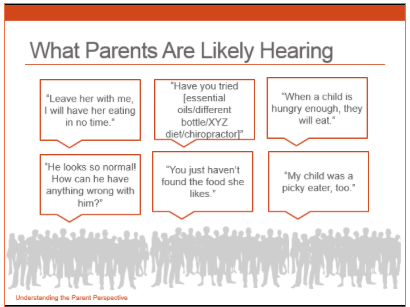 Key questions: Is child taking all day to eat? 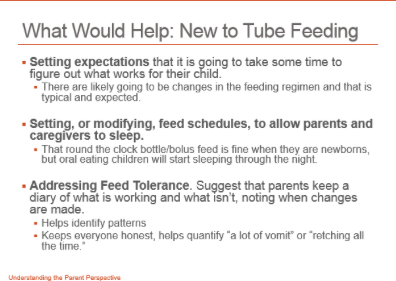 Is child choking with feedings? My personal experience with these devices is quite limited. However, I did have one patient who resumed walking after placement of a 1-step dome device gastrostomy tube. He had stopped walking several months before, mainly due to some mild neurological problems. After receiving this PEG tube, he said he was in so much pain when he was sitting down that he started walking again. He was able to continue walking after switching to a different gastrostomy tube. This particular ‘miracle’ explains one of the pitfalls of this device. This patient had an embedded bolster. In the current series, the authors’ conclusion was that the 1-step PEG “has complication rates and outcomes comparable with standard PEGs.” However, their reported results suggest a higher rate of complications: embedded bolster occurred in 5%, cellulitis in 23% (6.6% needing IV antibiotics), and perforation occurred in 0.8%. Given the relatively small number of patients (n=121 who met inclusion) and retrospective nature of the study, whether these complication rates are significantly higher is a matter of debate. It should be noted that there may have been some selection bias given that there were only 31 patients less than one year in the study. With regard to embedded PEG tubes, the authors note that this complication rate typically is 2.3% with a traditional PEG. The authors minimize the discrepancy of their higher rate, noting the “importance of choosing the right size of the 1-step PEG.” For those who perform this procedure, this admonition sounds easy but in practice can be problematic. In addition, the main advantage of this procedure is the “1-step” procedure. Yet in Figure 2, the authors note that 67 (more than 50%) underwent a change to a balloon device. Bottomline: The authors state that the 1-step PEG, “in our opinion, is a preferable PEG technique for children who need long-term enteral feeds.” My opinion: I’m not a fan and think the 1-step, for initial placement, is less safe overall. Comment: while I agree with the conclusions of the abstract, it is worth noting that upper gastrointestinal series will pick up other abnormalities as well, including duodenal stenosis (which I have seen picked up on two separate occasions).